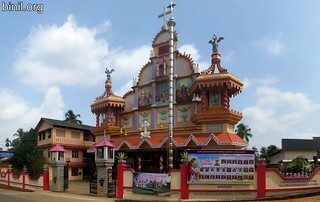 Our Lady of Mount Carmel Church (or simply known as Kundannur Church), is located in Thrissur dist, Kerala state, South India. Its on the way from Wadakanchery to Erumapetty. The church is around 21 km from Thrissur via Kumbalangad or around 26 km via Attathara. The Parish was established in 1856. 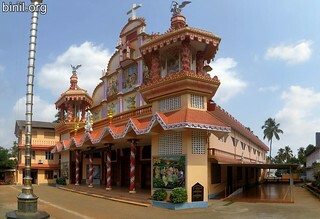 This parish is now under Wadakanchery Forane. This beautiful church that you see now is rebuilt on 2004. Thirunal is celebrated on October 19th and 20th every year. Click here to find the history of the church in Malayalam. Please check out other churches listed in this site.